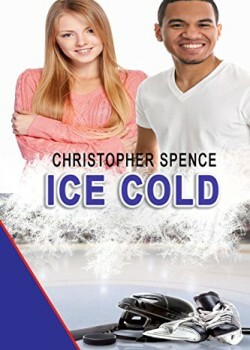 Ice Cold by Christopher Spence is a young adult novel that features a mixed-race teen couple (he’s black, she’s white) in an exciting, multi-layered story that defies convention and explores contradictions—not only between the leading characters, but also among their friends and families. The contradictions between the lead characters could not be starker. Jackson, an African American boy growing up without a father, contends with family dysfunction, struggles with the mental and financial demands of premature manhood, and suffers the consequent bitterness and anger. Heather is a popular white girl who enjoys the romantic attention of the star hockey player, the security of a solid family, and the privileges of material comforts. And while the two could be viewed as stand-ins for the current American racial and social divide, the author manages to infuse them and their story with genuine drama, unique tensions, and refreshing authenticity. The story builds up suspense beautifully as matters of the heart, agitations of teenage social status, and challenges to perceived norms, all combine to instigate clashes of words and muscles. The author deftly avoids clichés and dodges sentimentality by maintaining a lifelike balance of action, conflict, and the characters’ internal thoughts. The dialogue flows smoothly, always fitting the speaker’s age and background, including the secondary characters, who invariably seem real and palpable. Even the predictable violent confrontation between the two boys over Heather defies convention and surprises the reader in how it transpires and how it turns out. In summary, Ice Cold by Christopher Spence is a compelling novel that paints a vibrant canvas of young adults (and the adults in their lives) confronting realistic challenges in a genuine setting, explores friendship and fairness in today’s complex world, and delivers a spellbinding story that will keep readers hooked from beginning to end – not only because of the author’s natural talent at creating an authentic milieu, but also due to the characters’ believable emotional depths and conflicts, which draw us in and keep us turning pages to the very end. Highly recommended!